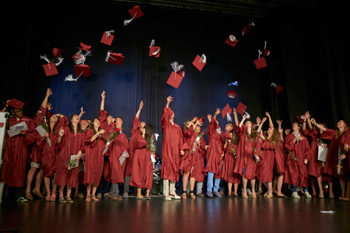 Here at Brillantmont we’ve nurtured countless young minds throughout our 130-year history, and wished all of them a fond farewell upon moving on to the next chapter of their lives. Let’s hear from three recent or soon-to-be leavers – Koffi from France, Laura from Colombia and the parents of Jeremy from the USA. "I want to thank everyone at the school, all the teachers, even the ones I didn’t have. I’ve learned a lot from all of them about studies, but also about life. “Brillantmont is the first school that I actually love from all my heart. For three years, I was happy to wake up everyday at 6 o’clock in the morning and be with my international family. Today, after having met all these nationalities here in Brillantmont, I feel myself to be a citizen of the world. I’ve learned so much from each person that I met here. You are all parts of me and I will never forget you." "I know it sounds a little corny, but BM became a part of me. I remember the first week in this school, when I cried every night in my room because I missed my family very much. I begged my mom to take me back to Colombia. Now I'm crying but for another entirely different reason; now I'm begging my mom to let me stay another year in this school! I honestly do not want to go. “The people I met this year are some of the most amazing people I've met in my life and I hope they will stay with me for my entire life. I'll never be able to thank the school for all it has offered me – friends, taught me to be independent, and to always follow your instincts no matter ... now are my last days in this school, but like everything, at some point it has to end, and I just want to say thank you, thank you for everything you have given me." "When we learned of a chance to spend two years in Switzerland, we had some initial doubts if it was the right time, since our son didn't like the idea at first, and it would mean that he would see the last two years of high school there. We were sure he would see it differently, when looking back on it later in life. We were happy to find a school in exactly the right place - Brillantmont. He immediately made friends among many different nationalities from all parts of the world. Since he has been here he has visited at least ten other countries. We can see how much he has matured. He has always had confidence, but he now has added a broad world outlook which would not have been possible if he had stayed in his home country. He has a bright future. It remains up to him to make it happen."